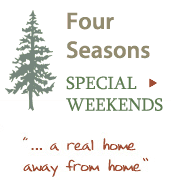 When you arrive at the Four Seasons Motor Inn, you'll find a clean, comfortable, and relaxing room awaiting you. 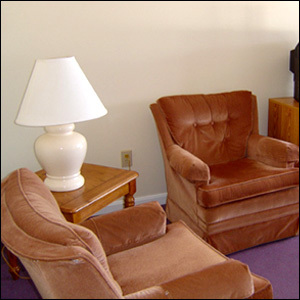 Each offers excellent views of surrounding White Mountain peaks, as well as an excellent value for your travel dollar. Choose from a single, double, king, or deluxe king bed, and enjoy features such as a color television, an easy chair, an snack and game table, individual heating control, and a full bath. 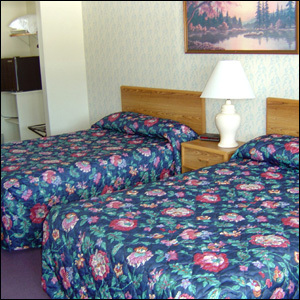 The Four Seasons Motor Inn also offers air conditioning, cots, and cribs upon request. A standard double room consists of 2 double beds and can accommodate up to 4 people. If there are five people in your party and you do not wish to upgrade to a larger room, we can add a cot into this space to house the extra person. A Deluxe King room has an extra large king sized bed. This type of room can accom- modate a couple or a single individual staying alone. if you are traveling with a small child the room is large enough to accommodate cribs and portable playpens. if there are more than 2 adults in your party we recommend the standard double. The adjoining rooms are perfect for groups, friends and family staying together. 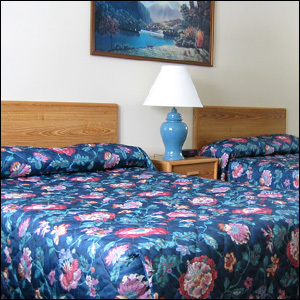 Each room has two double beds and cots can be added as necessary to accommodate extra people. With so much do to while you're here, you may not end up spending much time in your room... but we guarantee you'll love it when you do!